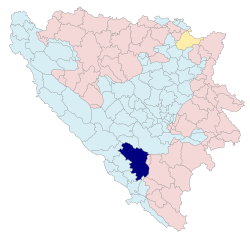 Mostar is a ceety an municipality in Bosnie an Herzegovinae, the lairgest an ane o the maist important ceeties in the Herzegovinae region an the centre o the Herzegovina-Neretva Canton o the Federation. Mostar is situatit on the Neretva river an is the fift-lairgest ceety in the kintra. Mostar wis namit efter the brig keepers (natively: mostari) who in the medieval times guardit the Stari Most (Auld Brig) ower Neretva river. The Auld Brig is ane o the ceety's maist recognizable laundmerks. This page wis last eeditit on 10 Mairch 2018, at 21:18.